Game Changers is a semi-regular column featuring games which have had a significant impact on me over the years. Games that were so incredibly stunning and awe-inspiring, they changed my conception of what a game could be at the time. Previously, I have written about Out Run and The Elder Scrolls IV: Oblivion. This time, I decided to highlight my all-time favorite fighting game. My first experience with the Street Fighter series was Street Fighter II: Champion Edition, on the Super Nintendo. The game had come out only a few months earlier and a buddy of mine had just gotten his hands on a copy. He invited me and another friend to a sleepover at his house, and the three of us stayed up all night playing it obsessively. We were all new to fighting games, so we spent hours passing the controllers around, taking turns battling it out in order to learn the basics and familiarize ourselves with the characters. It was a lot of fun. Over the next several years, I played a few different versions of Street Fighter II (Hyper, Arcade). Eventually, I even picked up a copy of Super Street Fighter II (The New Challengers) for my Sega Genesis. I loved being able to play with the newer characters, especially Dee Jay and Cammy. Even though I enjoyed spending a lot of time with all of the various iterations of Street Fighter II, I eventually grew weary of game's limitations and moved on to other, better fighting games (Virtua Fighter 1 & 2, SoulCalibur, etc). Fast forward to December of 2000. I was home from college for the holidays and browsing around the local Media Play store for Christmas gift ideas. My brother and I had spent most of that summer playing the hell out of his new Sega Dreamcast (I picked one up for myself by the end of summer break); I decided to hit the games section to see if I could find any potential presents there. I happened across a marked-down copy of Street Fighter Alpha 3. My brother and I had both gotten a good amount of entertainment out of my aforementioned Super Street Fighter II cartridge a few years earlier, so I decided that he might like to give Alpha a try (neither of us had owned a PlayStation or Saturn so we weren't very familiar with that series). When he unwrapped the gift on Christmas morning, I explained to him that I had picked it out because of our prior shared enthusiasm for Street Fighter II. He looked at it approvingly and agreed to give it a shot. Later that day, we fired it up and inadvertently ignited what would become a life-long passion for all things Street Fighter. Poor Adon is no match for the combined might of Ryu and Ken. As fun as Street Fighter II had been, it was nothing compared to Alpha 3. The beautiful graphics, depth of gameplay, insane number of characters, wealth of content and features, excellent soundtrack...all of it was incredible. My brother and I were instantly hooked. We played the game more or less constantly over the next several months (separately and together). A few months later, I picked up my own copy to play on my Dreamcast up at school. Each of us beat the game dozens of times, on various difficulty levels, and with a number of different characters. Every time I came home for a break or a long weekend, we would test our newly developed skills against each other to see who had improved more. Sometimes it was him, sometimes me. Either way, whoever held the slight advantage, never held it for long. Every session we had, after playing enough matches to determine superiority, we would always close it out with an obligatory round of the brilliant co-op mode, Dramatic Battle. Dramatic Battle is one of my favorite features of Alpha 3 (really, one of my favorite features from any fighting game). I honestly think that every fighting game would be vastly improved by including it. There are two different options for Dramatic Battle, plain and Versus. 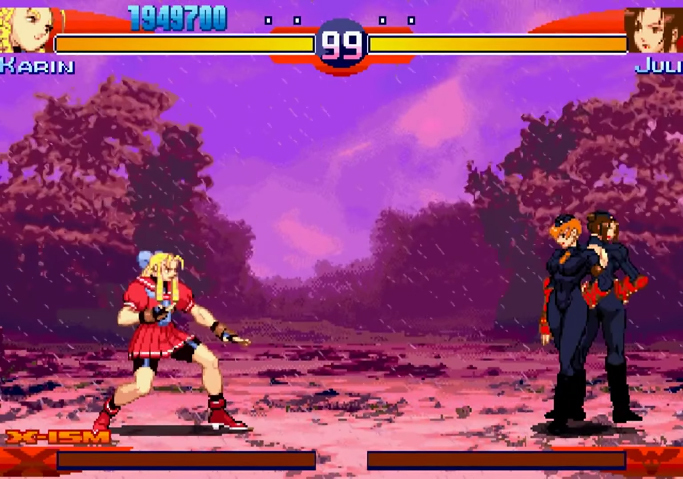 In the Versus version, you can have three players face off in a lopsided 2 v 1 match-up. Unfortunately, we usually only had two working controllers at any given time, so we always just stuck with the regular version. Standard Dramatic Battle is like a shorter version of arcade mode, but with co-op. Two players fight together, 2 v 1, against a series of six AI-controlled opponents. You can pick any two characters from the roster to play as and you have to fight, in order, Adon, Akuma, Balrog, Vega, Sagat, and finally, M Bison. The opponents in this mode are much tougher than in the regular Arcade mode, but what's cool about it is that you and your teammate each have separate health bars. That means that even if one of you gets knocked out mid-round, the other can continue fighting until either both of you, or the enemy, has been defeated. Just like Arcade mode, if you both lose a match, you can continue right where you left off and try again. After defeating M Bison, you are treated to a staff roll (credits) and some victory music. Dramatic Battle goes a long way towards breathing some additional life into the standard player vs player/player vs AI fighting game. It's a lot of fun to be able to switch things up and form a team with somebody after having pounded on them (or having been pounded on by them) for a while. There's also something satisfying about having a teammate for support/sympathy whilst taking on occasionally frustrating AI opponents (much more so than having to go it alone). Again, it's just a shame that more game developers don't think to add such a fantastic mode to their fighting games. The number of characters in Alpha 3 is staggering. 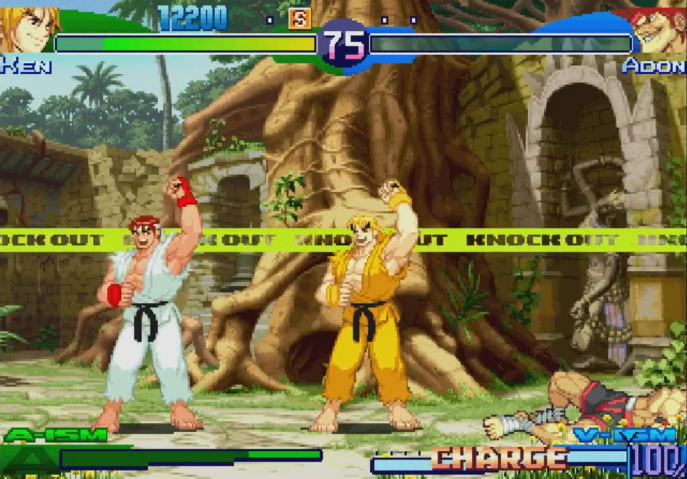 All sixteen playable fighters return from Super Street Fighter II (and Akuma). Then you've got Gen, Birdie, and Adon, from the original Street Fighter, and Cody, Guy, Sodom, and Rolento from Final Fight. If that weren't already more than enough to satisfy any fighting game fan's needs, Capcom decided to go ahead and add some brand new characters to the mix. Over the course of the Alpha series, these included Charlie, Rose, Dan, Sakura, Karen, R Mika, Juni, and Juli. Finally, they also decided to throw in two alternate versions of characters, Evil Ryu and Shin Akuma. In case you weren't keeping track, that's a total of 34 different characters. For a (mostly) one-on-one fighting game, that is an incredibly substantial number of fighters! For comparison, the original Marvel Vs Capcom (which came out around the same time) only had sixteen playable characters, and that was a two-on-two fighting game! What is even crazier is that, not only are there 34 different characters in the game, but each one has their own unique story, mid-story match-up, semifinal match-up, and ending. Some of them even have unique pre-fight interactions as well (a la King of Fighters). Nearly every single character also has their own unique stage and music. The only exceptions, stage-wise, are Evil Ryu, Shin Akuma, and Juni and Juli (and only Juni and Juli share music). 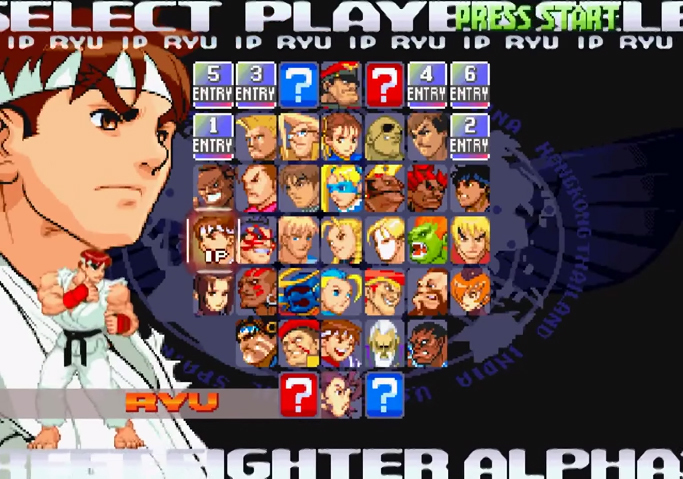 Even the successors to the Alpha series, Street Fighter III and IV, had way fewer stages and characters (IV did eventually surpass Alpha 3's character count, but only by the third version). With 35 different stage themes in the game (including the training theme and an additional unique battle stage theme), you might expect some of the music to be repetitious or forgettable. But every song in the game stands apart. Each one is upbeat, catchy, and/or appropriately dramatic. Many of them, you just can't help bobbing your head along to (my personal favorites are the ones from Sakura's and Dan's stages). I actually enjoyed the music so much that I recorded it all to create my own soundtrack to listen to whenever I wasn't constantly playing the game. Even now, years later, I still enjoy listening to that music from time to time (I have since purchased an official copy when it became available though). Newcomer Karin gets ready for her semifinal match-up against fellow newcomers Juni and Juli. (Together!) How awesome is this game?!? As I mentioned earlier, I had been somewhat of a fan of Street Fighter with II, but Alpha 3 managed to hook me for life. My obsession with the game transformed into an obsession with all things Street Fighter (and Capcom as well, to a slightly lesser extent). I began to collect and play, not only the latest Street Fighter titles, but any games I could find with even a slight connection to Street Fighter. This led me to discover the brilliant Final Fight series (which I had somehow missed), as well as other phenomenal Street Fighter related games, such as Super Puzzle Fighter II and the Capcom Vs SNK series. I even went so far as to seek out Street Fighter in other mediums, such as the brilliant Street Fighter II animated movie (by which the Alpha series was inspired), as well as the incredibly well-done Street Fighter: Assassin's Fist web series. If you aren't familiar with either of those, do yourself a favor and check them out. Unfortunately, I also discovered the abysmal Legend Of Chun-Li movie, but we can just pretend that cinematic abomination never happened. 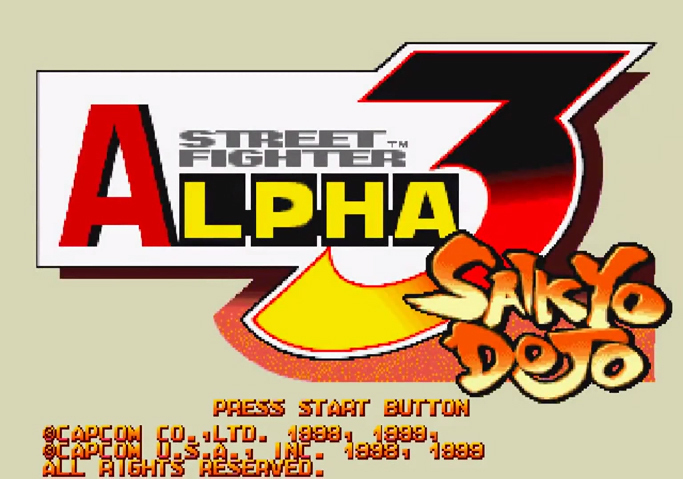 For as many great fighting games as I have played since first discovering Street Fighter II all those years ago, none of them have been able to hold my attention like Street Fighter Alpha 3. SoulCalibur 1 & 2, Street Fighter III: 3rd Strike, and Capcom Vs SNK 2 all came close. I still play those from time to time, along with the most current version of Street Fighter IV, but Alpha 3 will always by my weapon of choice. Taking everything that Street Fighter Alpha 3 offers into consideration, the beautiful graphics, great music, exceptional content and features (I didn't even mention the incredible World Tour mode), there's really no other fighting game quite like it. It's the first thing I want to bust out whenever I'm visiting with my brother, it's the first game that springs to mind whenever I hear about the latest Street Fighter news (I really wish they would make a Steam version, by the way), and I am always, always down for a couple rounds of Dramatic Battle (just in case anyone's interested). Founder and Kinda-Editor-In-Chief at Twinstiq.